What do p.m. and a.m. mean? In todays modern society where everything runs by the second we have become almost mechanical and we now eat when it is time to eat as well as sleep when it is time to sleep not when we need to do those things. The history of timekeeping is very fascinating and it just shows how far we become as a civilization from counting the days to atomic clocks that will not loose a second in thousands of years. First thing that usually interests people when thinking about time is why time is counted with the number 12 not 10. And there are many theories why this is the case but the most promising is that simply it is more easier to divide 12 with 6 and 3 and so we get 12 months 12 + 12 hours and 60 minutes as well as 60 seconds. 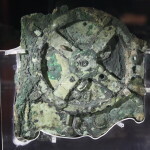 The first timekeeping devices that were built where sun dials or also known as shadow clocks where you put a stick of some sort in the ground and observe how the shadow of that stick moves throughout the day and mark everything to get a pretty accurate way to tell what time it is. Of course there are some drawbacks like the sun is not shining in the dark and when it is cloudy you don’t get any shadows but for thousands of years sun dials were effective enough that no-one needed to create anything more modern. Then the next chapter in timekeeping was the creation of water clocks where by slowly dripping water inside a reservoir of some sort you could observe how much time has passed. This of course is also not ideal as water freezes below 0 degrees C and these clocks were not as accurate as you may think but they were the step in the right direction as now people had a means to tell time even when the sun was not shining. Then the next step forward was a creation of candle clocks that used the burning of a candle as a way how to tell time and basically you got 24 identical candles that each burned for 1 hour and when the first was burnt out the second started. This was a pretty accurate way to tell time and was used by noblemen and aristocrats. Then the next step in timekeeping was the hourglass clock that used sand and glass to create a hourglass shape that slowly dripped those sand grains and when all of those grains were trough then a certain amount of time have passed. Of course this was not an accurate way to tell time but it was accurate enough to measure hours and even half hours of appointments and many other places where previously time keeping was an issue. But the most noticeable revolution was in the mechanical clock making when the first pendulum clocks and later spring loaded clocks were made. These things were portable and was accurate enough to only loose a couple of seconds every day. And that was enough to star using them on ships as well as in military. And in the first world war the first wristwatches were a crucial part of the warfare as it was very effective when an army could simultaneously attack in a pre-determinate timeframe. After mechanical clocks the next invention was quartz Crystal clocks thats used the innate properties of quarts that when an electrical current is applied to this material it starts to resonate and this resonation can be measured to an accuracy of 1 second in 24 hours. And that was enough to create the modern watches that we still use today. But because world needs much more accurate universal time then there was another invention and that was the invention of an atomic clock that uses Cesium atoms and their spin to determine how much time has passed and these clocks are so accurate that even the definition of one second had to be replaced with a new value. Atomic clocks are used in all modern timekeeping devices in stock exchanges as well as all around the world and they are so accurate that an atomic clock wont loose one second even after 10 thousand years. So do you know what is the time? Atom clocks are the most accurate clocks is the world witch can get the time right at the accuracy of loosing only 1 second in 130 million years. This is a remarkable feat of engineering and the fact that we, humans, have created something this precise amazes me. But what is more amazing is just jot sophisticated but easy the mechanism is for this atomic clock. An atomic clock uses the same technology that your quartz wrist watch uses but it takes it up a notch and makes it so precise that this clock will not loose a second in millions of years. Usually watches work by jolting quartz crystal with electric current and letting it oscillate and by counting those oscillations we can tell what is the precise time that has passed from one measurement to the other. But because Quartz crystals oscillate they slowly loose energy and they start to oscillate a bit less and that is bad for measuring time. That is why in atomic clocks Quartz crystals are kept oscillating at 5 million times every second and a constant electrical jolt is allied to that crystal when it slows down by the tiniest bit. If you would construct a perfect quartz crystal clock it would loose a second in around 90 thousand years but that is not good enough for out very precise time-keeping devices and out global economy and that is why the atomic clock was produced. Atomic clocks in addition to that quartz crystal uses Cesium atoms to keep that oscillation of that crystal constant and it dies this with the help of Cesium high and low energy particles that can be easily separated with magnets. When a stream of cesium atoms is separated into high and low energy states you can take those low energy atoms and give them just enough energy to bump them to the higher energy state and then by detecting those atoms you can create an electric current and with a feedback loop zap that quartz oscillator at the right frequency so that it will not slow down. When that quartz crystal eventually starts slowing down then that electric current will be lower and that will tell the system to zap that crystal with an additional current and with this mechanism create an enclosed system that will not loose a second in those millions of years. These amazing atomic clicks are so precise that they can even measure the relativity that Einstein predicted and that is why the atomic clocks that are up in space that are used for your GPS need to be constantly adjusted because their time passes a little bit slower than ours. It is amazing that we have come so far that we can even measure so minute time differences that we need to adjust our reading according to the laws of physics and the fact that time is relative. Without atomic clocks there would be no GPS and many other of out modern inventions would also struggle to work properly starting from out electric grid to the internet connections and data transfers across internet. 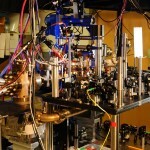 And because this technology has now been around for decades these atomic clocks can now be made to fit inside a box that is no bigger than 10 centimeter cube and because of that these clocks can be mounted ins servers in cars, planes, ships and on spaceships as well as on satellites to create our modern time keeping world. Copyright © timedesign.sk All rights reserved.